Bill Patterson was sitting with his friends in the front of his high street shop. From the wooden ceiling above his head two dozen T shirts, in assorted sizes and colours, hung down like curtains of weed in a grotto, but the shelves which lined the walls of the little den were stocked with tins of peas and milk powder and suchlike. Meanwhile, the tired old counter at the back of the store carried a display of batteries, a rack of postcards, and sixty or seventy eggs, each one nesting in the pocket of a pile of open cardboard trays. Patterson’s customers were sitting at a table in the centre of the small square room, drinking rum, but their host was behind the counter, sprawled on a bench. Excuse me,” I said, as I entered upon the scene. We had just that morning arrived in the island, and we had spent the past couple of hours sitting on the other side of Patterson’s emporium, on a broken-down concrete veranda at the back of the shop. Just two steps outside the front door of the shop cars and mini-bus taxis hurried past with a squealing of tyres and a revving of engines, but just two steps from where we sat, out the back, the blue-green sea put out little tongues of foam and licked the icing-sugar sand. Beyond the beach our little ships, with their sails now furled and folded, sat at rest above their fragmented reflections. After three weeks on the sea this was certainly a good place to wash-up. “Excuse me,” I said to Patterson. We had friends-of-friends to find in Carriacou, and I wanted to make contact. “Do you have a phone book?” I asked. Patterson reached out and picked up his phone. “Who yuh wan’?” he asked. Not “Andy who?” Or even, “Do you mean Andy So-and-so”. Not even, “Hold the line, please. 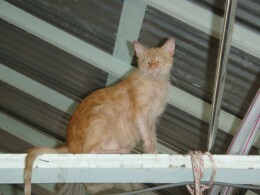 while I look”. 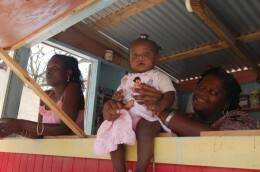 Does she know the number of every Carriacou-citizen (or Kayak), I wondered? After 1,800 miles of empty ocean with not another soul in view, this island feels like a very small and friendly place to wash up. From Hillsborough we moved on round to Tyrell Bay. 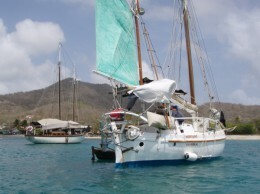 After a year spent kicking around in the Canaries and the Cape Verde islands, this anchorage was a bit of a shock. But, somehow, after we had settled in the throng of yachts seemed hardly noticeable; and, besides that, who were we to complain? 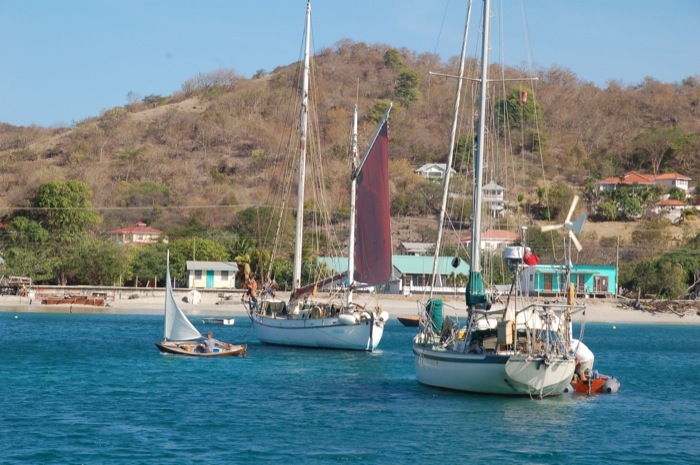 To the folks who make their home in this little corner of Carriacou, yachting visitors such as we are meat and drink; we bring in the work and we bring in the dosh, and we are therefore all made to feel very welcome. The settlement lining the shore of Tyrell Bay is called Harvey Vale. To me, the name conjured up a rather negative image. I pictured an ex-pat housing estate made up of tacky bungalows, each one set upon a neat lawn fringed by bougainvillea. In reality this is straggling community of shabby ill-assorted buildings, some newish and some oldish. It is a laid-back, low-key sort of a place. The bars and restaurants are small, and not at all glitzy; the grocery shops are ill-stocked and ill-lit. And taking its place in the line, between The Bayside Bar and Alexi’s Supermarket, stands Andy’s sewing shop – a delightfully ramshackle place with murals painted on the inside of the shutters and cats creeping about in the rafters. 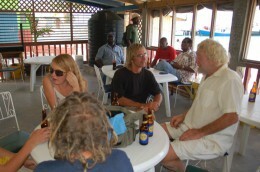 Andy Smelt came to the Caribbean thirty years ago and has spent the past ten years and more in Carriacou. During this time he has mended hundreds of sails, made scores of awnings, ridden out a couple of hurricanes in the mangroves, in his yacht, and got to know pretty much every other one of the island’s 4,000 residents – or so it seems. Andy Smelt’s principal claim to fame in the island stands parked outside his loft. Even in a big town a 750cc ex-police motorbike with a sidecar attached is going to get you noticed, and in a place this size it brings instant fame. One morning Andy offered to take your intrepid reporter for a spin. Well, actually, that’s a lie. The fact is that one evening your reporter plied the poor chap with large amounts of beer, and having swallowed the proverbial shilling he found himself press-ganged into taking both herself and Rox for a ride. 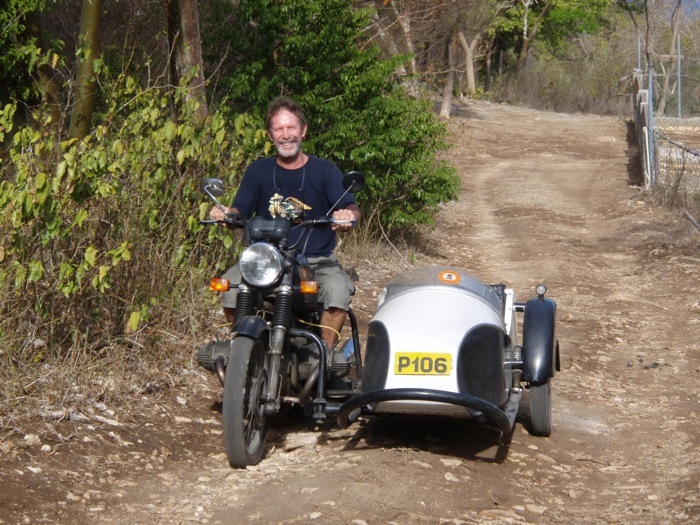 Roxanne and I squeezed into the side-car, and off we went, skimming along the country lane which is Carriacou’s main highway. Hard hats are not a requirement here, and so we travelled in unfettered style – yes, in foolhardy style, if you like – with the wind in our hair. 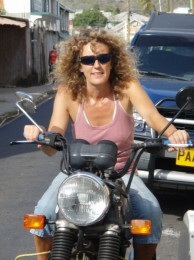 Given that there are only three other bikes on the island there can hardly have been occasion, yet, to pass any safety laws for motorcyclists. Indeed, as Andy explained, until recently there were very few vehicles of any sort in Carriacou. This presumably explains why there also appears to be no drink-driving law. Or at any rate, there is nothing – or no one – to stop a happy motorcyclist from swinging along the lane with one hand on the handlebars and the other holding his beer bottle. 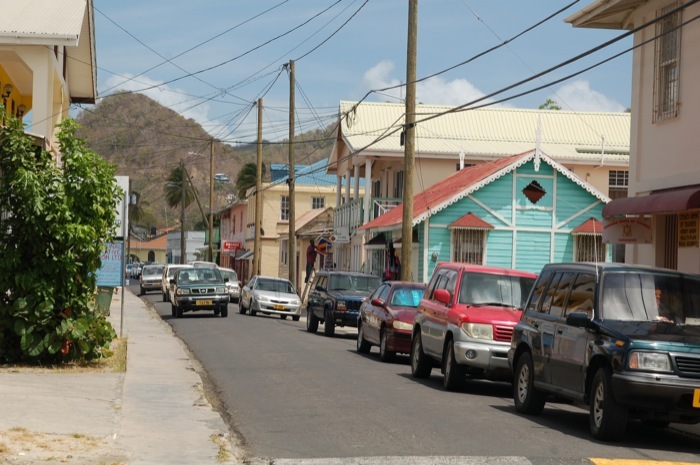 Whilst one can only applaud Carriacou’s lack of nannying road safety laws (until one comes a cropper, of course) one feels rather differently about the country’s lack of environmental legislation. Our first stop, as we toured the island, was a visit to some turtles which had been brought ashore by the local fishermen. 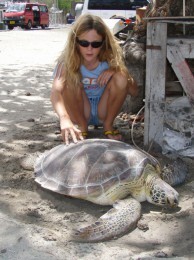 Up until now I had been under the impression that turtle hunting was banned all throughout the world – but ‘taint so. Lying in the hot sun on the beach in Tyrrel’s Bay were four hawksbill turtles and one green turtle, and the islanders also bring in loggerhead turtles. All three of these animals are on the World Wildlife Fund’s Endangered Species list. 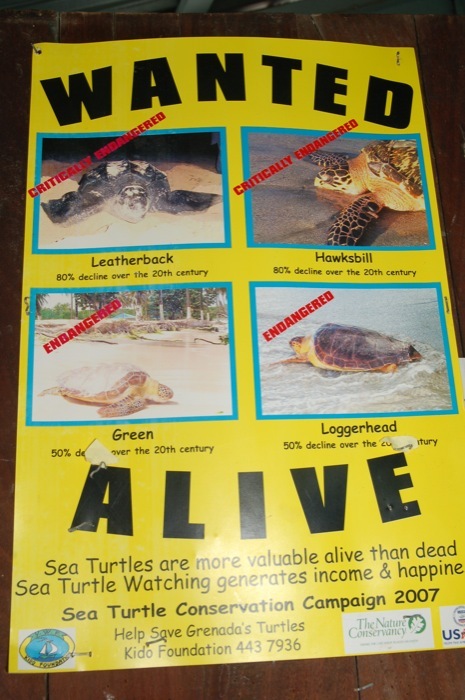 The only species they are not legally entitled to catch is the leatherback, which is critically endangered. So far as the islanders are concerned, their industry is small and it is traditional – but with so few turtles remaining in the world even a small-scale fishery has an adverse impact. According to local environmentalists, there are now only ten fishermen who set nets in the channels amongst the coral, deliberately intending to catch the turtles which swim around Carriacou, but each of these men catches somewhere in the region of 600 turtles every year. 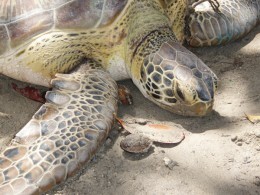 Turtle meat currently fetches 12 EC dollars per pound in Carriacou. (That’s about US$6 per lb, or £6 per kilo). 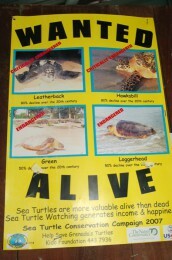 So when the conservationists want to save the life of a turtle they have to cough up an equivalent sum. Whereas it is said to be relatively easy to get funding for a research project, getting a grant for buying condemned turtles is more or less impossible – or so I am told. 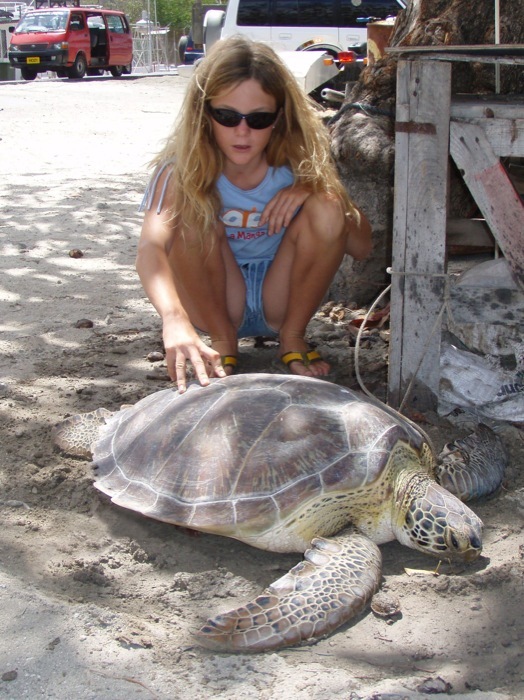 Thus, the Carriacou Turtle Conservation people welcome donations. Presumably there is a danger that the ecologists will someday be the only buyers, and that the Kayak fishermen will be bringing in the turtles only to have the diving school take every one of them back out to sea… but as we have already discovered, Carriacou is a very small place; when that happy day arrives the fact will be well known and the conservationists will withdraw their “support” for the industry. Turtles are not the only animals to suffer from Grenada and Carriacou’s lack of environmental policy and from the local people’s willingness to eat almost anything that moves. Roxanne had been told that if she were lucky she might see an iguana. So she did – in fact, she saw three – but, alas, the poor beasts had already been captured and decapitated. “They taste exactly like chicken, “said the young Rastaman who had captured them. He showed us the long bamboo pole which he had used to hook the reptiles from where they had been sitting. Generally they hide in the tree-tops, but right now Carriacou is stricken with drought; most of the trees are brown and bare, and the animals have come down onto the ground to search for water. 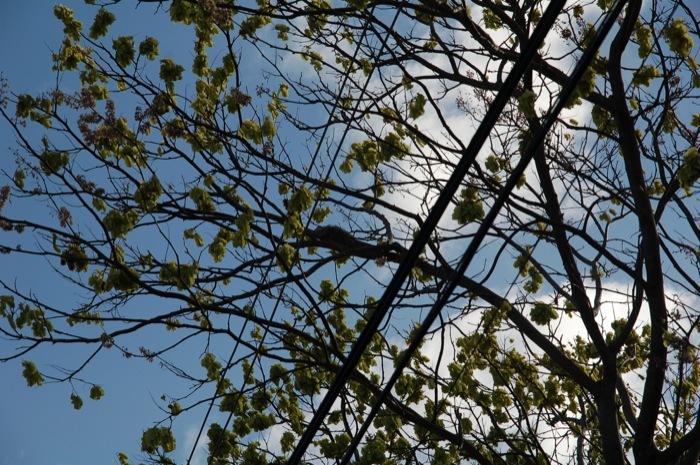 The hunter’s long pole carried a noose at the far end, and all he had to do was spot an iguana and swiftly and surely slip the noose over its head. No. 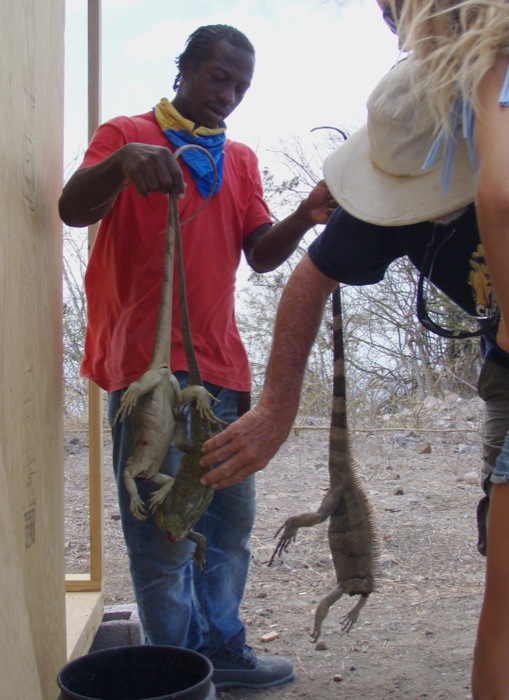 He was sure that there were thousands of iguanas on the little island. And some people have no education. Having learnt to slaughter the iguanas promptly, and so put them out of their misery, the young hunter could presumably also learn about conservation issues. Even so, given that he probably earns a pittance, and given that the cost of living in Carriacou is very high, our young Kayak rasta is not very likely to favour the idea of forking out for an imported chicken when there is food to be had for free. No discussion of food and diet in Carriacou would be complete without mention of The Grenada Chocolate Company. Established ten years ago in the mother isle, this wonderful little business buys its principal raw materials from a co-operative which owns and works 150 acres of cocoa farms in Grenada. As a result, the growers get a far bigger slice of the profits and a far better deal than they would if they were selling their product to a middle-man for shipment overseas. Chocolate differs in taste depending not only on the method of production but also on the soil in which the beans are grown; and Grenada’s soil and her climate are reckoned to be ideal for the production of a bean which is especially rich in flavour. The cocoa is all organically grown, and so too are the other ingredients which go to make up one of these very special chocolate bars. The sugar is organically grown in Paraguay, and the vanilla essence is organically grown in Costa Rica. And the milk? No, there is no milk in these chocolate bars; they are all 60%, 75% or even 85% cocoa; the kind of choccy bars that chocaholics such as your correspondent crave. Besides being socially responsible and making an excellent product, the folks at The Grenada Chocolate factory are also environmentalists. They power their machines on sunlight. And the company delivery van is wind-powered. 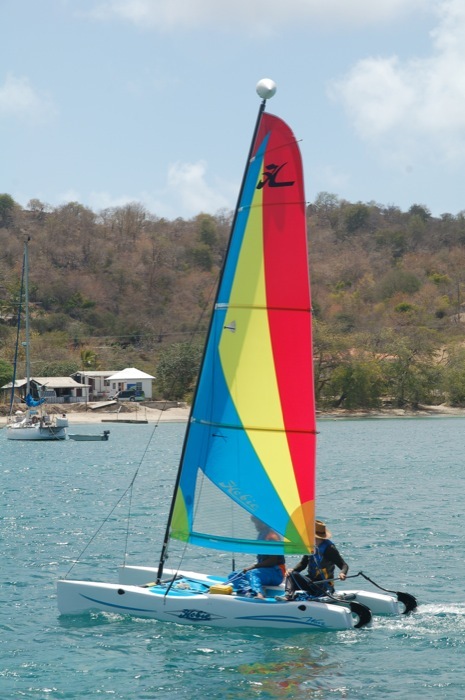 I kid you not; “Chocolate Chap” himself delivers his company’s chocolate bars, two or three times a week, to the island of Carriacou, and he makes the journey in his 14ft Hobie Cat…! This is the OPEN SEA that he is crossng, by the way; not just a pond or a narrow channel but 17 miles of open sea! 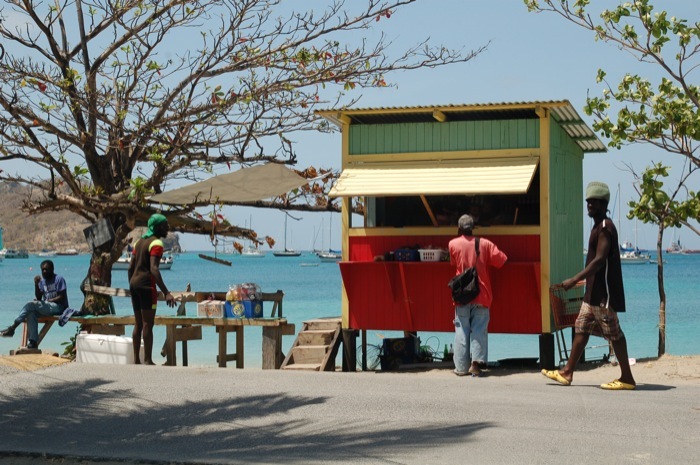 Generally speaking, it is the locals who bring colour and character to a place, but Carriacou is home to a bunch of the most “bush” ex-pats that one could ever wish to encounter, and they make the locals seem fairly wishy-washy by comparison. Besides having their own little idiosyncrasies (such as riding around on a police bike, or ferrying freight aboard a racing dinghy) they also express their personalities in their choice of housing. Well; Andy is an exception – he resides aboard his yacht, and that, as we all know is the most sensible place for any person to live. 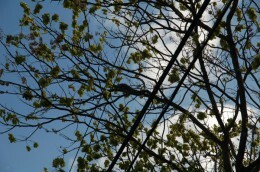 But rumour has it that “Chocolate Chap” used to live in a tree, with a monkey. Moreover, we hear that he now lives underground, in a burrow. Then there’s Don, an antique American who has lived here in Carriacou for more than twenty years. 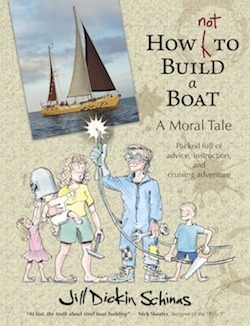 Once again, this man is a sailor (we sailors only ever meet sailors…) and his home is a floating one – in his case, it’s an ancient gaffer – but although he doesn’t want to live in the dirt, Don does like building houses. On the top of a hill overlooking both sides of the island of Carriacou he is building a house which is completely spherical. 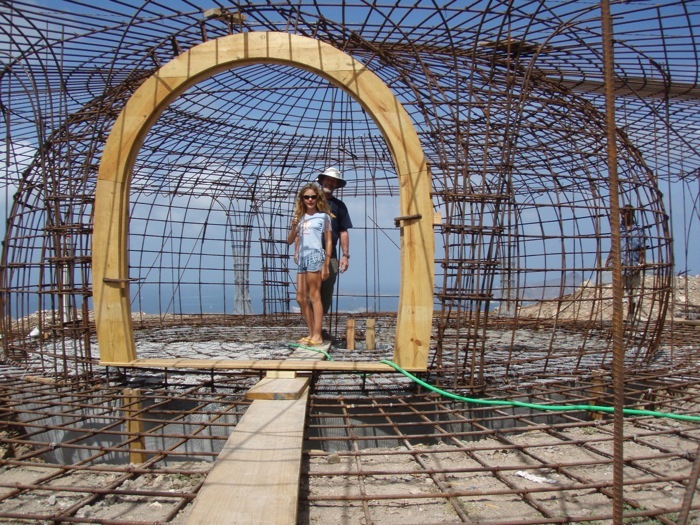 Don’s boat is wooden, but he is building the house according to the methods employed in ferro-cement boat construction. The basic framework consists of a steel-reinforcing rod sculpture clad in chicken wire. At the time of our visit the workers were busy daubing on the cement which will form the walls of this high-tech adobe abode. Meanwhile, a few hundred yards along the track, beyond an old sugar mill and tucked away in the woods, another yachtsman is putting together a house which starts twelve feet above the ground. Ivan is well-known in our home port of Chichester Harbour as the owner of the splendid Victorian cutter, Thalia. But having owned and maintained the old girl for 30 years, Ivan and his wife, Fi, reckon that they have done enough varnishing for one lifetime. The house that Ivan is building features walls which will drop down, like the portcullis in a castle, allowing the breeze to blow straight through the open plan dwelling. Ivan and Fi seem to imagine that they will henceforth be spending their days perched in their lofty roost, gazing out through the leaves at the sea. Very nice… But old sailors never do quite manage to swallow the anchor for good, and I suspect that this couple will soon be back on the water. 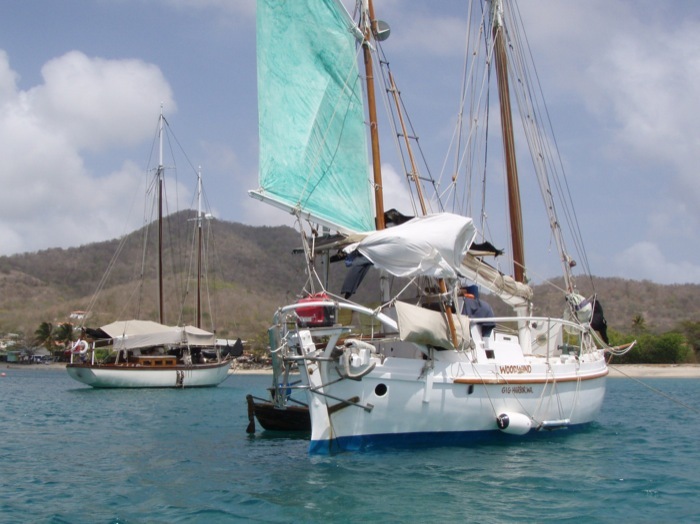 Perhaps they will find themselves a nice little Carriacou-built sloop to play with – or perhaps, with his skills as a wood-worker, Ivan will actually decide to get in on the act and build himself a local boat. Tiny it may be, but Carriacou is home to the most productive and successful boat building industry of the West Indies. Before we left the island we paid a visit to the boat-building village and looked at the new boats under construction – but we will tell you all about that in another article. Having located this bunch of wonderful wacky characters the only sane thing to do seemed to be to get them all aboard for a party. Mollymawk parties are legendary – but these poor innocents were not to know that; and we, for our part were not to know of the evils of the local brew: Jack Iron. Jack Iron used to be brewed exclusively in Carriacou and it used to be brewed illegally. It is now produced by a factory in Trinidad and enters the country via the proper channels; or, at least, some of it enters above-board and with its paperwork in order. That makes it possible for the rest of it, also, to be sold without restraint. Even so, you will not usually find Jack Iron sitting on the shelves of the supermarket. You buy it “under the counter”, and you provide your own bottle. Jack Iron’s reputation had reached us before we ever set foot in Carriacou, but although we knew that it was strong we didn’t know that it is actually 86% alcohol. This makes it more than twice as strong as your average Bacardi or Mount Gay. According to the locals, it is the strongest liquor in the world, barring methylated spirits. In effect, it is not so much a drink as a form of suicide. But, you see, I didn’t know that; not until afterwards. There we all were, anchored in Tyrells Bay. There was Andy, aboard Yellowbird, and Johnson aboard Cherub. 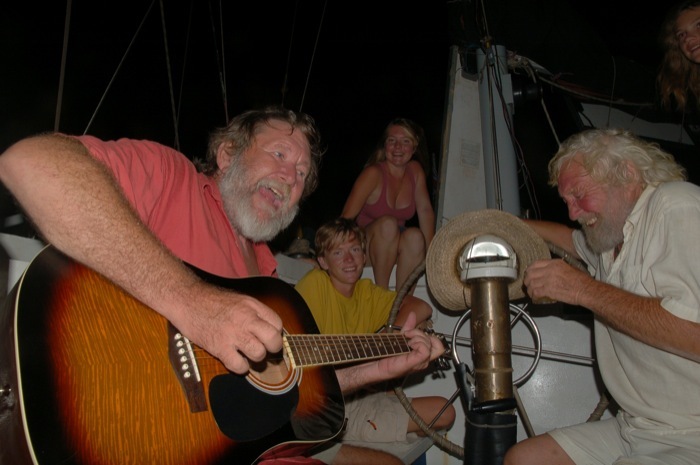 There was Johnson’s good friend Tom Gallant aboard his Nova Scotia schooner, and Bruce and Jan aboard their down-sized version of Johnson’s boat. “No problem. We’ve got some booze in the dinghy here,” he said. And so saying he hopped into Cherub‘s tender, returning a moment later with a bottle of Jack. After that, the merry company became increasingly, uproariously happy. And then they fell apart. One by one they went to the rail and puked. One by one they fell into their dinghies and then out of them into the sea. Upon learning that Andy had been permitted to set off home alone, I suggested that Nick ought to go after him. Nick couldn’t find Andy’s boat but he found Bruce and Jan rowing around trying to locate their own fair vessel. 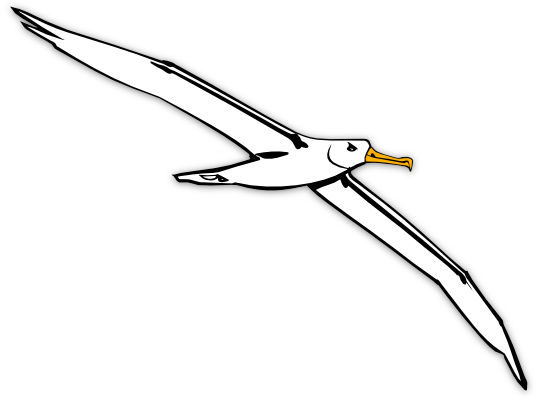 Woodwind wears a bright green mizzen so it shouldn’t have been difficult. Tom Gallant is a professional musician and he had been entertaining us with his guitar. I suppose I should have realised, when he started yodelling, that all was not well, but since Tom’s ability to handle the guitar seemed unimpaired I let him head home under his own steam. The following day we noticed that his little wooden rowing boat was tied alongside his boat but that it was completely swamped. 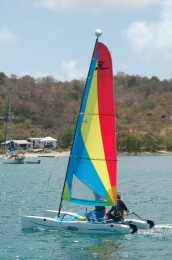 Seemingly, Tom found his yacht – eventually – but in trying to climb aboard he capsized the dinghy and landed in the drink. His oars, as I write, are on their way to Panama. “It was Jack,” said Xoë. The Austrians were the last to take their leave of us. Having puked, very politely and neatly but with much vigour, David managed to get aboard his dinghy and Sonja saw to it that they got safely home. On the following day they went diving…..! But they, alone, amongst the rum-swillers, were capable of getting to their feet that day. Even the hardened sailors were under the weather for twenty-four hours, and it was four whole days before Tom, Andy, and Bruce felt themselves to be fully recovered from the effects of the evil brew. In short, Jack and Jill (and Merlin) nearly wiped out the entire anchorage. The moral is to keep your Jack Iron safe from the reach of small children (such as Merlin) and to restrict its use to the oiling of custom’s officials and the cleaning of paint brushes. We visited a rum distillery on an island named Nosi Be off Madagascar and were treated – wine connoisseur style- to 5 year old, 10 year old and 20 year old rum. Wow! Later when time came to buy, since glass bottles were allocated only to the premium vintages – which we could not afford- we chose to take our own Rum Ordinaire back on board in 25 litre plastic jerrycans originally intended for diesel. Later when we held our version of the rum party with the proviso that since it was intended to celebrate anyone born in December- therefore Saggitarians- it had to be a Saggy party. As proof of this and to ensure all entered into the spirit of the day -all underwear was confiscated before guests were allowed to board and their discarded garments were set amongst the rigging- to dress ship. Needless to say we had not provided sufficient mixer ( or sufficient time or maturation)so the party reached a crescendo and then a crash – with everyone visiting the rail to call various species of fish. ( barracuda, Halibut, Dorado – in fact for those who had lost too many brain cells – simply an extended “shout” of Fiiissshhhh! did the trick! Luckily no black eyes though. I stumbled upon your digital log book during a nostalgic mood brought about by the recent decommissioning of the best ship I served aboard in my 12 year career in the U.S. Navy. I was quite young and didn’t fully appreciate how special many of the times and places I had been privileged to experience were. Even so, the few days we spent on the Grenadine island of Carriacou stuck me as something special. The USS John L Hall (FFG-32) anchored two miles from the island on August 2, 1987. For four days the Officers and Crew partook of music, food, sport and of course the annual Grenadine Regatta Festival events. Being August the heat and humidity were astounding to me as I had left Holyloch Scotland and it’s cool temperatures only weeks before. Copious amounts of rum and an occasional dip in the crystal clear water kept me from completely melting. The local people were so friendly and down to earth and there were travelers from around the globe there as well. These four days will forever be some of the fondest memories I have from my “Navy days”. Thanks for posting this trip down memory lane.